Scotland could "sneak under the radar" at the World Cup, says former international scrum-half Andy Nicol. 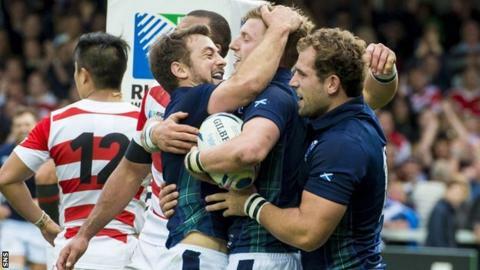 The Scots sit top of Pool B after a 45-10 bonus-point victory over Japan on Wednesday. "If we can get the four tries and have 10 points from the first two games, Scotland will be in great shape." Vern Cotter's side scored five second-half tries against a Japanese team that had shocked South Africa in their opening game. Scotland only had a half-time lead of 12-7 at Kingsholm before stepping up a gear after the break. "There was genuine quality in that performance," said Nicol, who won 23 caps for Scotland. "A lot of it was based on very good defence initially to soak up all the pressure that Japan threw at Scotland. "Then Scotland went down the other end and very clinically scored five tries." The two teams that progress from Pool B will face up with those that emerge from Pool A, which contains England, Australia and Wales. Nicol is clear about the opposition he does not want Scotland to face if they get through. "England at Twickenham is really tough and we haven't won there since 1983," said the former Bath and Glasgow player. "I would love to avoid England. "The two teams you're looking to avoid are New Zealand, because they're that good, and England because it's at Twickenham. "So, if we can get to a situation where we're not playing England in a quarter-final, I'd be delighted, because I think we'd have a right crack at Australia or Wales without any fear of knowing we can't beat them." Dundee-born Nicol, who lifted the Heineken Cup as captain of Bath in 1998, reckons the gulf in quality between rugby nations is decreasing and points to New Zealand's 58-14 win over Namibia as an example. "That was the biggest gap in world rankings," he added. "Namibia were the lowest ranked and New Zealand were the top ranked, yet it was only 58 points. "In tournaments gone by, that's been over 100 points, so I think you can see how the world order and the gap is actually changing. "New Zealand are the team to beat, but I think there are other candidates. "England at home are tough, Australia looked pretty good the other day and Ireland have got a great draw. "I think there are candidates and there's a little country called Scotland who might just be sneaking up the rails under the radar."